Enlarge iStockphoto.com A large sandstone feature in southwestern Colorado, Chimney Rock became America's newest national monument on Friday. 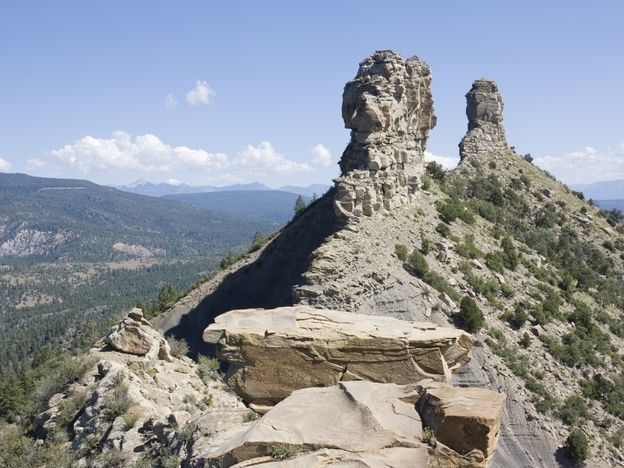 President Obama named a new national monument on Friday: Chimney Rock in southwestern Colorado. With two sandstone spires soaring from a mesa, not only is Chimney Rock a spectacular place; it also provides a fascinating glimpse into the ancient people who lived in that region more than 1,000 years ago. The moon usually rises south of the stone towers at Chimney Rock, but every 18 or 19 years, the moon rises directly between the two huge pillars. This feature seems to have been especially important to a society known as the ancestral Pueblo people. They built their largest building — what archaeologists call their "great house" — to have a perfect view of this astronomical wonder. Archaeologist Steve Lekson says that this great house is actually still standing at Chimney Rock, and it is a remarkable sight. "The location is just stunning," he says. "And then they architecturally positioned themselves on that ridge out near those two huge pillars to make that thing really impressive."